Aim and Objective: Potassium 2-oxoimidazolidine-1,3-diide (POImD) as a novel and reusable catalyst was used for the synthesis of pyrazolyl-bis coumarinyl methanes by a nucleophilic addition reaction of synthetized pyrazolecarbaldehyde and two equivalents of 4-hydroxycoumarin under grinding. The catalyst can be reused and recovered several times without loss of activity. This method provides several advantages such as eco-friendliness, simple work-up and shorter reaction time as well as excellent yields. All of the synthesized compounds were characterized by IR, 1H and 13C NMR spectroscopy and elemental analyses. 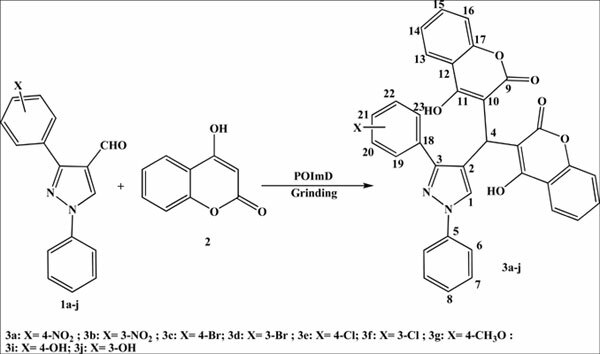 Material and Method: Synthetized pyrazole carbaldehyde 1a (1 mmol), 4-hydroxycoumarin 2 (2 mmol), 1 mmol of POImD and 10mL of H2O were ground in a mortar by a pestle for 30-90 minutes. After the completion of the reaction, as monitored by TLC on silica gel using ethyl acetate/n-hexane (1:2), the mixture was allowed to cool to room temperature. After completion of the reaction, we extracted the product with CH2Cl2/H2O. This was followed by separation of phases, evaporation of the organic phase and recrystallization of the residue with 50 mL of ethanol/H2O (1:1). The pure product was then obtained in 87 to 96% yield. The aqueous phase was concentrated under reduced pressure to recover the catalyst for subsequent use. Results: To continue our ongoing studies to synthesize heterocyclic and pharmaceutical compounds by mild, facile and efficient protocols, herein we wish to report our experimental results on the synthesis of pyrazolylbis coumarinyl methanes, using various synthetized pyrazole carbaldehydes and 4-hydroxycoumarin in the presence of POImD in aqueous media at room temperature. Conclusion: Finally, we developed an efficient, fast and convenient procedure for the three-component synthesis of pyrazolyl-bis coumarinyl methanes through the reaction of pyrazole carbaldehydes and 4- hydroxycoumarin, using POImD as a novel and reusable catalyst. The remarkable advantage offered by this method is that the catalyst is non-toxic, inexpensive, easy to handle and reusable. A short reaction time, simple work-up procedure, high yields of product with better purity and the green aspect by avoiding a hazardous solvent and a toxic catalyst are the other advantages. To the best of our knowledge, this is the first report on the synthesis of pyrazolyl-bis coumarinylmethane derivatives using potassium 2-oxoimidazolidine-1,3-diide (POImD). Catalyst, solvent-free, grinding, 4-hydroxycoumarin, three-component synthesis, potassium 2-oxoimidazolidine-1, 3-diide.